All manufacturersMILVIZ / REX Game StudiosREX Game Studios, LLC. Search "FSXSE" 1 result has been found. REX 4 Texture Direct with Soft Clouds Enhanced Edition is a global environment texture utility, effects and sound enhancement add-on and takes advantage of the core features of Prepar3D while enhancing both FSX and Prepar3D. 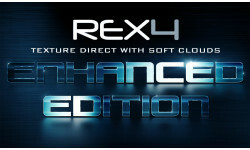 This package includes integrated REX Soft Clouds.